Dustin [Clean] Denes is a Black Belt 4th degree in Brazilian Jiu-Jitsu, master instructor and world-class competitor﻿ supreme. He is best known for his accomplished submission skills. Dustin’s knowledge is both battle tested and backed by teachings of the Club Carlson Gracie, Marcus Silveira and Ricardo de la Riva. 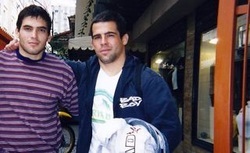 In 1999, Dustin traveled Brazil with his friend and mentor Antônio Rodrigo [Minotauro] Nogueira. He then moved to Rio de Janeiro to maximize his progress in ﻿﻿Brazilian Jiu-Jitsu. He spent more than two years as a brown belt with the Brazilian Top Team, competing against and beating the best in Brazil. He became Brazilian Champion in 2000 and achieved the rank of Black Belt in the fall of 2001. Dustin is truly cultured in The Art and The War of Brazilian Jiu-Jitsu. His competition experience in Brazil alone exceeds hundreds of matches, combined as a Purple, Brown, and Black Belt. His most competitive years as a kimono fighter were spent battling amongst the best in Rio de Janeiro and São Paulo, Brazil. Inspired by winning results, one of his many signature submissions earned him an addition to his nickname "Clean, o Rei do Triângulo" which translates to "Clean, King of the Triangle." After a professional mixed martial arts debut in Japan, Dustin returned to the United States and accepted an opportunity to be part of a new team. He chose to compete and strive for success in Mixed Martial Arts for years to come. Dustin played a major role in the founding and first generation of the American Top Team. Dustin is a Master Jiu-Jitsu Expert and Strategist speaker. He earned a BS in Marketing from Florida State University and an International MBA from Florida International University. However, real world education and global achievements provide him his sharp edge. Fluent in Portuguese, his goal is to further excel in the world of martial arts, and to transmit his knowledge through his teachings, inspiring youth and helping kids to beat the streets! BJ Penn put his name in Jiu-Jitsu history after being the first North American World Jiu-Jitsu black belt champion. American Dustin "Clean" Denes of Brazilian Top Team showed that he has some of the same stuff. Completely addicted to Jiu-Jitsu, Dustin Denes left his family, and a degree in Business Administration to come to Brazil and learn Jiu-Jitsu. "I started training at Carlson Gracie Miami, but my life really changed when I met Rodrigo Minotauro Nogueira. He brought me to Brazil and I decided to live to learn Jiu-Jitsu. So I went to live in Brazil," says Dustin, nicknamed by a Brazilian coach as CLEAN. As soon as he got to Brazil four months ago, Clean started to train all day long. "I with Brazilian Top Team fighters in Murilo Bustamante's academy from 11 to 3 o'clock, then I take some açaí (batido de berries) and go straight to de la Riva's school for hours of training, late afternoon into the night." Dustin is known for recording all of the details of his training sessions. "He has everything he does in the computer," says Antônio Rogério "Minotouro" Nogeuira, twin brother of MInotauro. Rogério shares an apartment with Dustin in Rio de Janeiro. After four months of training really hard, Dustin got a big gift....the Brazilian national title in the brown bet open weight division. He won the bronze medal in the category; he defeated two opponents, and lost to Erick Wanderley in the semi-final. Dustin ran after the GOLD on the last day of the competition. To get there, Dustin choked out two highly respected fighter; first, Anderson Leal, then Marcelo Garcia (Alliance) in the final. FCF: How did you find out about Jiu-Jitsu? DD: I trained freestyle wrestling for 7 years of my life. One day a friend of mine took me to Carlson Gracie Miami, so I started to train there. I loved that, in Jiu-Jitsu I started using muscles that I didn't even know existed. FCF: When did you realize that your Jiu-Jitsu had improved? ﻿DD: When Minotauro took me to Brazil, I knew that if I wanted to learn, I should come to Brazil where the best trainers are. When Minotauro brought me here and I had the opportunity to train with the best, I decided to move to Brazil and live to train and learn Jiu-Jitsu. FCF: What do your parents say about that? DD: They supported me. Actually, the are very proud of me because they always taught me that I should run after my dreams, and that's what I did. FCF: So what's your dream? DD: My dream is to represent Jiu-Jitsu in Vale-Tudo., represent the Brazilian Top Team in Vale-Tudo and all the people who helped me like Minotauro and Carlson Gracie Miami. They built the fire in me and now the BTT added gasoline. ﻿FCF: Is it true that you have thousands of computer disks with notes of your training? DD: Yes, I really love to train. Normally, I train from 10 to 3 at Murilo's academy in Leblon. After, I take some açaí and go straight to de la Riva's academy in Copacabana, where I stay until the last training session. Master is a legend and most famous for his de la Riva guard. I love to train at de la Riva academy because its the best place to learn new positions. Ricardo de la Riva is a very knowledgeable and is one of the nicest people I've ever known. FCF: How do you feel after winning this medal? DD: I have no words. I feel really great because in the Brasileiro, you can face the very best that this sport has to offer. It has motivated me to train more and more. FCF: Is it true that after the competition you went to train? DD: Yes. I never stop because the enemies are training. I relaxed my body by running one hour on the beach. FCF: How is living in Brazil? DD: Amazing, Brazil is a natural country. I'm really feeling good here. Besides, Brazilians being really friendly, you can train and go to the beach and take some açaí, I really like it. FCF: You intend to someday bring everything you learn here to the American people? DD: Yes, someday in the future I intend to come back and give me experiences to Americans and help Jiu-Jitsu grow around the world. FCF: Congratulations and good luck in the next one. Above vid // Day in life, living and training with the best in Rio de Janeiro @ Clube Carlson Gracie, Brazilian Top Team, Ricardo de la Riva, and More. 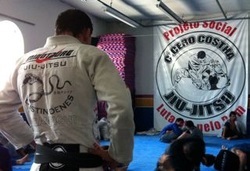 Dustin started his Jiu-Jitsu with Marcus and Marcelo Silveira at Carlson Gracie Miami in 1997. 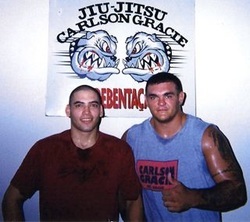 In 1998, he met Rodrigo Nogueira, and shortly after moved to Rio de Janeiro so he could train full-time at the Club Carlson Gracie and with Ricardo de la Riva. The Club Carlson Gracie was built on hard work and determination to win, backed by a drive to dominate the competition. In addition, Dustin was fortunate to train full-time with Minotauro and Ricardo de la Riva in the nights. Dustin was a purple belt when many of Carlson Gracie's best black belts decided to split from the club, and create a new team - Brazilian Top Team. 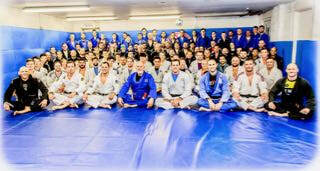 Dustin joined BTT, and the temporary training location became Murilo Bustamante's academy in Leblon. BTT later transitioned to full-time training at the AABB. All the time, Dustin continued to train with Ricardo de la Riva in the nights. During these years, Dustin trained with the absolute best and committed himself to winning championships. After many years in Rio de Janeiro, Dustin became well-known by his professors and training partners as "Clean, King of the Triangle" for his near unstoppable triangle choke. Dustin's longtime coach goes on to emphasize other great qualities.. Among many techniques, Dustin was also credited for his relentless back attack. Above pic // 2000 Rio de Janeiro Dustin Denes dominates Marcelo Garcia via vicious back attack. Above vid // Relentless back attack via Dustin Denes, footage from the Jiu-Jitsu Championships in Rio de Janeiro. 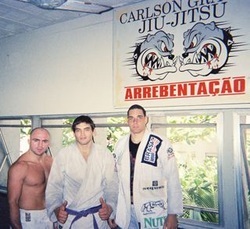 Above pic // 1997 Miami with Marcus Silveira at Carlson Gracie Rio - Miami. Nothing fancy, just strong basics. Above pic // 1999 Rio de Janeiro with training partners Wallid Ismael and Carlos Santos. Post-training at Club Carlson Gracie, Rua Figueiredo Magalhães, nº 414 – 3º andar, 22031-010. Everyday was tough training, and Carlson liked us to compete against each other within the academy. Above pic // 1999 Rio de Janeiro with training partners Walter Pinto, Rodrigo Nogueira, Marcelo Toscano, Clean, Ricardo de la Riva, Rogerio Nogueira. Post-training at DLR Jiu-Jitsu na Raul Pompeia, Copacabana. Daily operation, night training and technical studies with DLR. Everyday was super-technical hard training. Above pic // 1999 Rio de Janeiro with Wallid Ismael, Carlson Gracie, and Carlos Barreto. Pic taken from the street Figueiredo Magalhães, outside the academy. Classic look from Wallid, always ready for a fight! 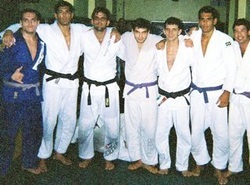 Above pic // 1999 Rio de Janeiro with training partners Suyan Queiroz, Zé Mário Sperry, Murilo Bustamante, Xuxu, Marinho, and Marcel Ferreira. Post-training at Club Carlson Gracie in Copacabana. Hard fought battles! 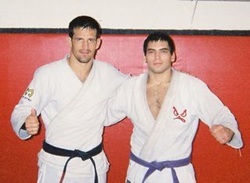 Above pic // 1999 Rio de Janeiro with professor and training partner Murilo Bustamante, at his academy in Leblon. Murilo was incredibly technical with Gi and without, both technique and strategy exceptionally geared for success in a real fight. 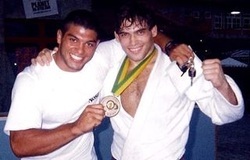 Above pic // 2000 Rio de Janeiro with training partners Zé Mário Sperry and Ricardo Arona. Post-training from the window at Murilo Bustamante's in Leblon. This was the beginning of Brazilian Top Team. Enormous progress was made in such a small space. 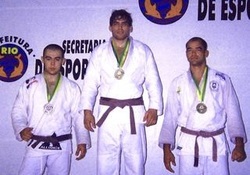 Above pic // 2000 Rio de Janeiro 1st place top of the podium - Brazilian Champion. 2nd place was Marcelo Garcia (Alliance) who I submitted via rear-naked choke and 3rd place was Anderson Leal who I submitted via triangle choke. The brackets were stacked with the best competitors from all weight classes. Long day of hard fought battles to reach the top, and submitted everyone! Above pic // 2001 Rio de Janeiro with training partners Rodrigo Nogueira, Alexandre Nogueira, Rogerio Nogueria, Moacir Omena de Oliveira, and Hudson Rocha. Post-training at the AABB training facility - Brazilian Top Team. Massive puddles of sweat made for super-slippery training, carry on. 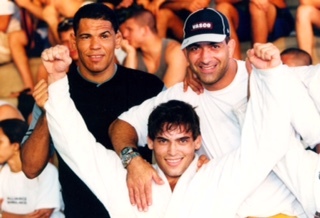 Above pic // 2001 Rio de Janeiro with training partners Carlos Santos, Ricardo Libório, and Olavo Abreu. Post-training at the AABB training facility in preparation for World Championship Jiu-Jitsu. Shortly after the pic was taken, I took an offer to make my MMA debut in Japan, so re-directed my focus to real fight. Above pic // 2010 Rio de Janeiro specific training with Ricardo de la Riva to celebrate the 3rd degree on my Black Belt. I was fortunate to learn from and train everyday with Ricardo de la Riva from 1999-2001, and 2013. After 2002, life and travels had me steady on the go, but I'd still visit the academy to evolve my Jiu-Jitsu for several weeks at a time. Above pic // 2013 São Paulo immersion interval at PSLPB / Cícero Costha. Education is an ongoing process, and for this reason I dedicate months at a time to train high-level and evolve. Ultimately, the lessons are passed on to my students, so they are empowered with an up-to-date Jiu-Jitsu. Above pic // 2017 London travels, studies with Maurício Gomes, Roger Gracie, Andy Roberts and Team. ﻿Dustin "Clean" Denes has been turning heads in the U.S. since last March when, what was then still considered Brazilian Top Team, touched down at Hook n' Shoot in Indiana. Shortly after that show and pushing the limits, Florida started their own franchise dubbed the American Top Team. ﻿FCF: You were fighting originally at 205 lbs.? FCF: So you are set on staying at 185 for now? DD: Oh definitely. Pound for pound I'm much better. FCF: You are relentless in your pursuit of submission, once you get the arm, it's just a matter of time. DD: I'm always prepared for the worst. I'm ready to punch, kick, wrestle, do jiu-jitsu, but to me submission very important because it just takes a moment. It's very rare someone is going to get knocked out one punch, it's an accumulation. DD: Submission is not an accumulation, it's just one moment. The right timing and the fight is over. That's it. That's very important to me, taking advantage of opportunities - and not only taking advantage but being able to capitalize and finish the job! I capitalize because that is the end of the fight and that gives me the victory. ﻿FCF: The degree that you are relentless does differ from of the rest of the American Top Team. DD: I'm always pushing the limits with the fighter on American Top Team we all learn together, but when I come home my work never stops. It's not only in the gym where I'm learning, I come home and study tapes. Everybody has a different approach, everybody has a different style. No matter how good a guy is or how bad a guy is, there is always something to learn. I think that is very important. FCF: Is there anything you want to get across in reference to your striking? DD: I'm always prepared for the worst. I'm well trained in everything and this is what I do. FCF: Do you even think about it, that you have a high percentage of finishing fights? DD: I go there prepared for the worst. If it's going to be three five-minute rounds, I'm gonna prepare for fifteen minutes of guerilla warfare. I always go in there prepared for war. FCF: What were you doing before this? DD: I was training in Brazil. I earned a 4-year college degree at Florida State University and an MBA at Florida International. I got a college background, then went to Brazil for a couple of years and dedicated myself to jiu-jitsu. I did a lot of wrestling in high school and freestyle, so I went to Brazil a competitor. FCF: How long were you in Brazil? DD: Off an on for 3 years. FCF: And that was when you moved from wrestling to Jiu-Jitsu? DD: No, I moved over to jiu-jitsu prior to that. I still wrestled even though I started jiu-jitsu. Wrestling is something that really compliments jiu-jitsu. FCF: Is there anything else that you think compliments jiu-jitsu like wrestling? DD: Anything. Someone can have the best jiu-jitsu in the world, but if he has no stand-up and no wrestling, it's going to weaken his jiu-jitsu because he's going to be preoccupied with the other elements. You've got to be complete. DD: What you put in is what you get out. Sometimes they look at the fight, it may have been a minute or two, but that was hundreds and hundreds of hours in the gym to make that one minute. FCF: It seems like that drive, that focus, occupies your entire life. There isn't much room for anything else. DD: No, that's it. When I'm training, I'm working. When I'm at home relaxing, my brain is working. I'm always working to get the adversary. FCF: Why the nickname "Clean"? DD: I used to have a shaved head, so they'd say "Mr. Clean." For the most part, they call me "Clean". A few of the guys call me "Cobra" at the school. Clean sticks with me, that's something that can't be removed.